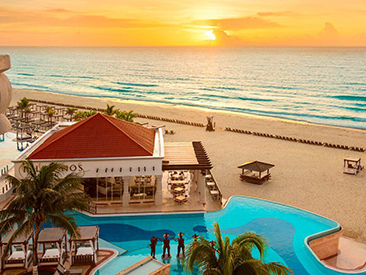 Hyatt Zilara Cancun, and all-inclusive resort, exclusively for adult guests (18+), is located in the famous Cancun Hotel Zone. This impressive, all-suite, beachfront gem is located on a beautiful stretch of newly expanded white-sand beach, with upscale shopping and high-energy night spots just minutes from the hotel's dazzling front portico. Setting a new standard of luxury in Cancun with impeccable attention to detail, a world-class Mayan-inspired spa and the finest Mexican hospitality, Hyatt Zilara is an optimal choice for even the most selective guests. 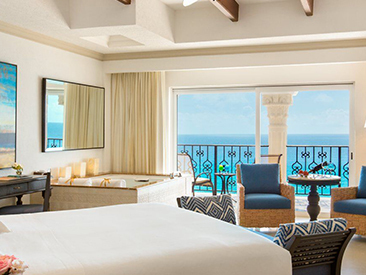 The Hyatt Zilara Cancun, a joyful expression of casual elegance exclusively for adult guests. All 307 spacious suites enjoy a spectacular ocean view (and, in fact, most are oceanfront! ), and over 80% include enhanced Royal Service amenities and facilities offering guests an elevated level of vacation indulgence. Setting a new standard of luxury in Cancun with impeccable attention to detail, a world-class Mayan-inspired SPA and the finest Mexican hospitality. Located 15 minutes from downtown Cancun, 20 minutes from the Cancun International Airport and moments from golf, shopping, restaurants and nightlife. Relax. Unwind. Stay Fit. Indulge. An Olympic-size oceanfront infinity pool with in-pool lounges and two Jacuzzis, a beautiful stretch of newly expanded beach with convenient 'flag system' waiter service, beach butlers and comfortable canopied beach beds and lounge chairs, a state-of-the-art fitness center and The Spa, the only ocean view spa in Cancun, with an extensive menu of eco-holistic Mayan-inspired spa treatments and exceptional hydrotherapy areas for men and women ... ALL combine for an elegant yet casual escape from the ordinary. 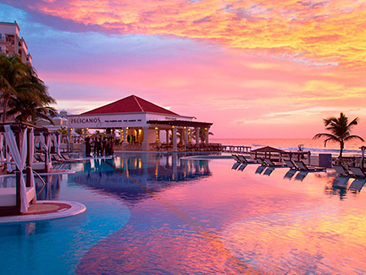 Please note that Hyatt Zilara Cancun caters to adults and families with children 18 and older. However, the adjacent Gran Caribe Real is an ideal vacation choice for families with a very active and well-organized Oki Kids Club on-site and a loving and competent team of activity coordinators that make every day special for young guests!